Leaving the site yesterday, I was blessed to see the most brilliant double rainbow! I wish my photograph was half as breathtaking as the real thing. The rainbow arched across the Rio Grande, confirming what I’ve always thought. We really are the end of the rainbow. While the drizzling rain kept two groups of little ones from visiting the site because of the mud that followed it, we are always glad to see rain. 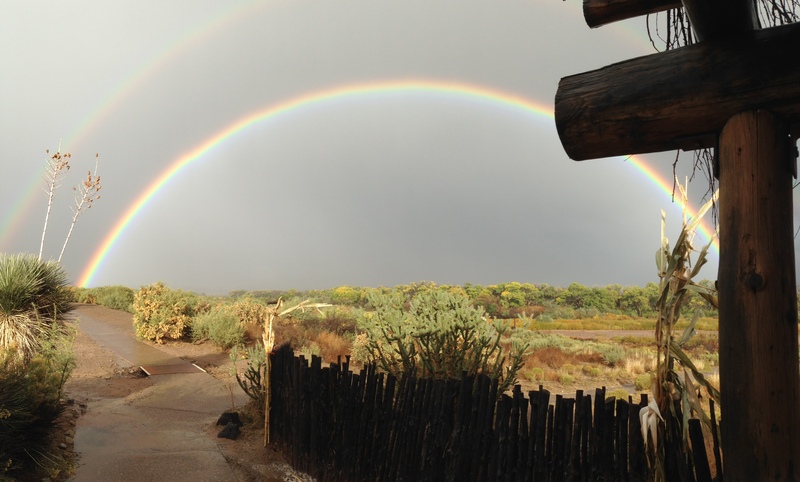 Tags: Coronado Historic Site, Friends of Coronado Historic Site, Photography, Rain, Rainbow. Bookmark the permalink. Previous post ← Fiesta of Cultures – Photo Gallery!